Spotibot is a clever little musical robot (or bot) that you can use with Spotify Spotibot seems to read your mind and suggests alternative tracks you may like to try that are similar to a particular band or your musical tastes. Drawing on rich Last.fm listening data and taking advantage of Twitter’s quick-fire aspects, Spotibot delivers on virtually all aspects of musical recommendation. Twitter: Get song recommendations by tweeting @spotibot similar to and the name of an artist. 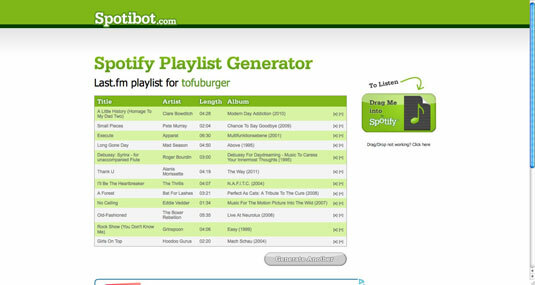 Spotibot then replies in minutes with a tune it thinks you should try. Last.fm login: Generate a Spotibot playlist based on your Last.fm recommendations. Just enter your username to get started and choose whether you want more-popular artists (chart-topping acts, as opposed to obscure ones) in the results. You can edit the playlist that appears by deleting tracks from it. Drag the large green Drag Me into Spotify button into Spotify to play the playlist (there’s an old-fashioned web link to the playlist below this button if you’re unable to drag and drop). Spotify Loved: Any tracks that you mark on Last.fm as Loved — which is like starring tracks in Spotify — can be turned into a playlist. Spotify recently made it easier for developers to create mobile apps that use Spotify data, so Spotibot creator Andy Smith is confident about expanding Spotibot’s features and bringing it to the mobile platforms very soon. Andy says Spotify continues to be very supportive of Spotibot, which has existed even before its official API.